Todays event was run by the event co-ordinator for the Randwick Library located in the Royal Randwick Shopping Centre. Representing the Rebel Legion and 501st were our AdamS. commander Rex and ShaneArc as a Tusken Raider. Also Representing the 501st was Luke who has the Boba Fett costume. 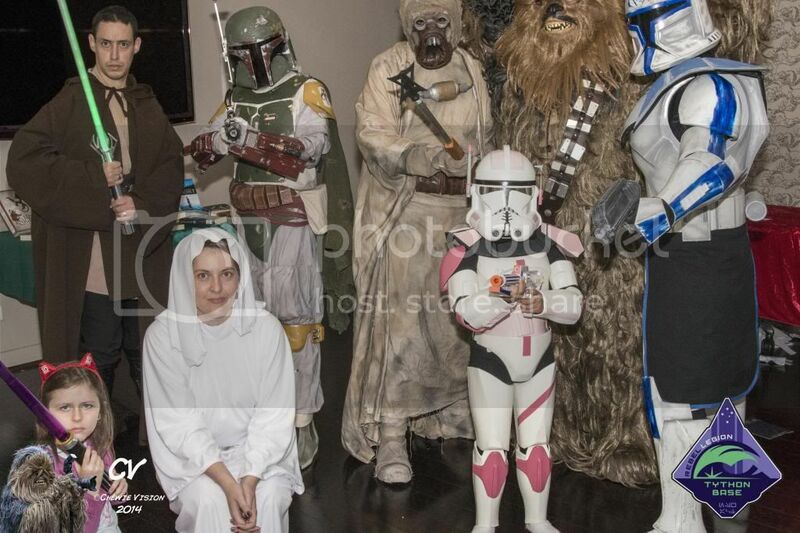 The Rebel Legion members who attended the event were Ahsoka Tano in her "A New Hope" Princess Leia costume and Chewie as Chewbacca. Sam, was very much pleased that the Rebel Legion had 3 people coming along to the event and especially that they were Princess Leia & Chewie. I was in a supportive role to my two esteemed colleagues and although I had a decent time, Leia and I where upstaged by Chewie. He had gotten ALOT of attention. He had the most Photo Time, virtually everyone both at the event and library patrons wanted a photo with him. Way to go Chewie. The coordinator also gave door prizes which I helped out with handing out assorted posters and some reading material for short stories. Towards the end of the event we had all taken many photos with various Teenagers and Sam was kind enough to allow us to hand out the FAQs and also a leaflet for the jedi outfits. I also organised a shot of a Tusken Raider, Commander Rex and Boba Fett Stomping on my corpse, I can't wait to see that photo. Overall the event was a promising start to an on going relationship and I hope this will prove to be a fruitful endeavour in more troops for the Rebel Legion and 501st. Thank you All who had attended and I'll keep you in touch.